I had to make a U turn and rearrange my hobby schedule. I got my box quite late so I won’t bother with a unboxing review. But I will review the game once all is painted and I have played it. Horus Heresy. World Eaters. War-hounds. Spartan assault tank. Part2. And I am done with this one. I think it turned out quite good. I really enjoy painting the War-hound color scheme! Horus Heresy. World Eaters Spartan assault tank. Part1. After coincidering this for quite some time. After asking forums, making experimental lists and thinking about it. I have decided to repaint my Iron Warriors spartan and give it to my world eaters. Now, this have not been an easy decision. I love this model. And I love seeing it on the tabletop besides Perturabos sons. But in all honesty I never add it to any Iron Warriors lists. And most of the time it just sits in the display case. So I am adding it to the army that will be able to use it better and absolutely more often. This is still a work in progress but I believe it will look great once it’s done. My own skirmish game. Kuggköping. Twiddle root gang. For about a year now, me, my spouse and a friend is working on a skirmish game. It is a very free and opened game, set in the city of Kuggköping. The “development” of the game is on its third revision and there is still a lot more to be done. But once it’s ready to be shared I will try to spread it here alongside other platforms. I don’t feel to share to much about the actual game right now due to the fact that the game can change dramatically between now and its “release”. But I can however talk a little about why. Why would you put yourself through the long and hard process of creating your own game? Being a big consumer of miniature games you come across a vast multitude of rules. I would say that every ruleset I have come across have all had some very good parts and of course some bad ones as well. We started to talk about how cool wouldn’t it be if this set of rules had rules just like that other game. Or why didn’t they added this feature to this game. Wish listing and hopping that the next edition would add something like that. For different reasons whatever company never did add those features or changed the rules like we had hoped. So why not do it our self? Add all the stuff we like, come up with our own way of doing things and wrap it all in a setting of our own choice. And that is what we started to do. Main focus is to create something that we enjoy. If we know what we like and have the total freedom to create whatever we want, then we would be able to create something that we would think is great. Our own “go to game” . That was the theory. The process of creating something that you like is however much harder. For one we discovered that we only had a basic understanding of what we actually like. And then it is not just up to us. You need some one to play with. The reality of life and all is complexity finds its way into what on the surface seems like a simple concept. But the game will happen and it will be done. Small steps forward is still steps forward. So let me introduce one of my war bands for Kuggköping. Twiddle root and his gang of trolls, oh and Oscar. In front: Twiddle root and Trigger. In front: Sproute and Oscar. Horus Heresy. World Eaters. Stormlord. I added a little something to my murder hord. The Stormlord! Since I found out about this tanks existence I have wanted it. It took a couple of years for me to find the “right” application for it. Now I am well aware about the dangers of putting loads of guys on this thing and driving it forward the enemy. The implications when this thing blows up is devastating. But it looks to cool to not use. And the dangers adds to the excitement. However I do think that the tank can be put to good use. Just don’t fill it up with everything you got. Try to find cover when ever you can. And get up in the face as quick as possible. For any Horus Heresy veterans out there you have probably already seen that this tank have loads of Aquila’s on it. And most people don’t like that. I however view it in a different way. First of all, this is a war hounds stormlord. The Aquila’s is left from loyalist times. Don’t mess with stuff that can upset the machine spirit. Second, I have a hard time imagining world eaters really carrying about it. If they would have any opinions about it I am sure they would see it as an insult to loyalist scums ;) . The new killteam is done. Quite please with it, will be fun to play them. Even if I only have played killteam three times I am quite hooked on the game. I like the fact that it is quick to play but still gives you a dose of grime dark. It is also a wonderful platform to create custom Killteams and explore color schemes and army’s you normally would not experience. This is one of these projects. I like the lore and background for the space marine chapter, the exorcists but I would never create a full on army. killteam allow me to get a taste :) . Still very much work in progress. I will run them with grey knights rules. I think that works well for this chapter. Horus Heresy. Word Bearers. Warhammer 40k art. I made some sort of a tribute to the magnificent word bearers legion. Just for fun 🙂 . I had so much fun making the previous picture that I decided to make another one. It felt really nice taking out my miniatures for a custom photo shoot. Might do another one, I really enjoyed this. The picture is a composition between real life miniatures that I painted, photos I took and added my own painting and drawings on top. All made in photoshop. And composed by me. Horus Heresy event. Battle of Hive City. The next installment of the events at the “AJAX system” will take place 4-6 Jan 2019 in Växjö, Sweden. I hope many will and can attend this event. For more information search after: Battle of Hive City - An Ajax Campaign event, on Facebook. Or visit our website: dirtyk.se/events/ajax . Similar to last event I was honored to make the front art for the event. And for fun I thought I could share the full picture and the “original” photo it was based on. Basicly I set up my gaming table, added some of my models, snapped some photos and photoshopped the rest. Super fun little project and such a privilege to get to do this for the event. Here we have to whole family. As the proud father that I am, I look forward to the future and all the great adventures we will have. The army might not look so impressive and it might be hard to understand why it have taken as long as five years to collect and build it. But as this have been a hobby within the hobby project it has been something I have invested time and money in the few occasions I have had this to spare. I feel very happy and I am looking forward to playing it. After five years of collecting, parallel to my other armies, I have finally completed the force I set out to build. This feels great! I now have 3000-3500p of Mechanicum fully painted. But like most things in this hobby enough is never enough. And I am all ready thinking about how I want to expand the army. I will however enjoy this feeling for little longer, Saver the grand taste of competition and bask in the glory. I also want to put my army on the table and roll some dice. Family portrait is coming soon. Just a quick update. Started on the six Thallax. One of my favorite units I Horus heresy, they look so cool! Mechanicum. Myrmidons secutors. Horus Heresy. A couple of weeks ago I bought some Myrmidons and Thallax models. The Thallax is unassembled but the myrmidons was assembled and half painted. So I have spent some days brushing the models up and adding my own personal touch. Only six more models, then I have finished my Mechanicum army the way I had it visioned five years ago, when I started it :) . Horus Heresy. Mechanicum. 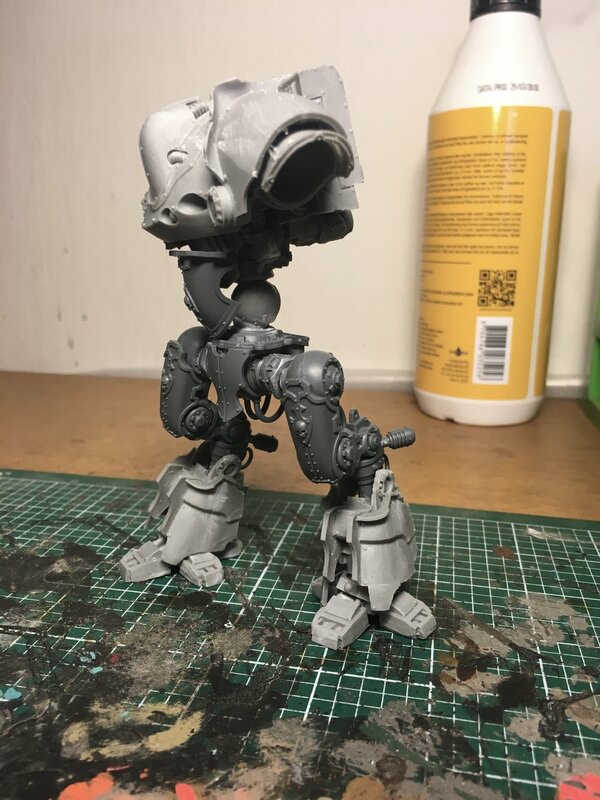 Thanatar Conversion. Part4. Done! So, here we are. As always you can always do more, add more details, push a little further. You can of course also do to much. But I feel pretty happy about it right now. The final steps is nothing to crazy. Add some highlights with a very light silver color. Paint the “glow” effect in the plasma mortar. Weather and add basing. I feel that you can come a long way with just regular spray cans, ordinary paint, washes and simple brushes :) . Horus Heresy. Mechanicum. Thanatar Conversion. Part3. Next part in the painting process. The first step was to push back some of the rust. I thought it was a little too much in some places. It is real easy, basically dry brush the area you want to push back. In this case it used metal/silver. A tip is to never do all your work in one day unless you have done the same process multiple times. Stepping away for a while and come back often reveal stuff you initially liked but now want to modify. After this it was time for some actual painting. I have seen some photos of old rusty and abandoned tractors in blue Lately and kind of like the contrast between the corrosion and the blue colors. So blue it is. I also what the colors to look weathered, shipped and old. To achieve something like that I painted the colors in blocks. More or less just dabbing the color on to the surface. First a light blue and after that a darker blue. After painting all areas I wanted blue I washed the blue areas in agrax earthshade. The last thing I managed to do in this step, was to paint some of the censors and added some nihilakh oxide to some of the copper parts and pushing the oxide back with a thin layer nuln oil. That’s it for now :) . Horus Heresy. Mechanicum. Thanatar Conversion. Part2. So, I thought I could break down the painting process for this conversion. Maybe it can inspire someone or give some ideas. The process is quite simple. The first base coat is black spray followed by a red/brown spray. After the base coat I dry brushed leadbelcher, added some details with runelord brass and washed it all in nuln oil. 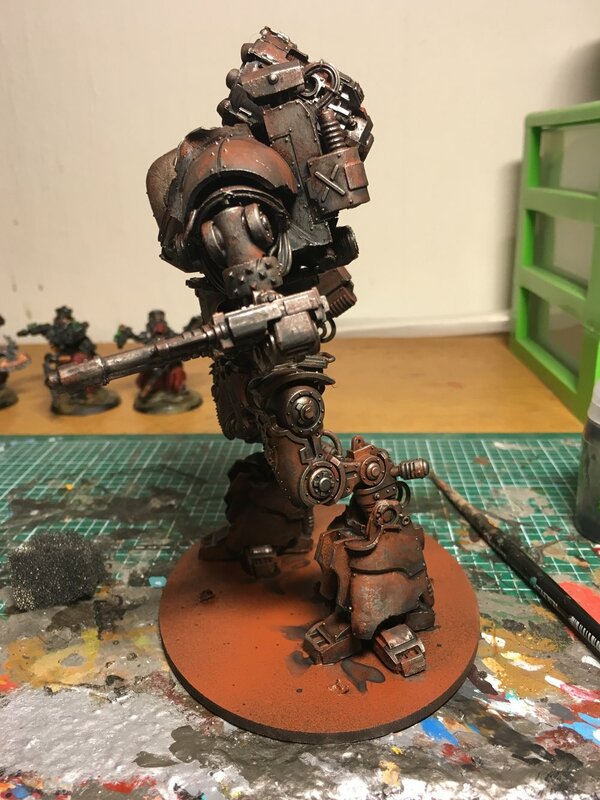 Once the model was dry I added rust using raza rust, nuln oil and seraphim sepia. Now, this is just the beginning of what will be the foundation. On top of this I will add some other colors. At the moment I am thinking of blue but I have not decided yet. Horus Heresy. Mechanicum. Thanatar Conversion. Part1. A few months ago I got a half Thanatar from a friend. He had first been thinking of using the parts for basing materials but gave them to me, thinking I would have more use of it. It have been sitting there on the table in parts, starting at me, beginning me to do something with it. This is still very much a work in progress. For example I am still looking for a good replacement for the mauler bolt cannon. Killteam 40k. Skitarii conversion. Militia 30k. Part2. The killteam is considered done and ready for action. I am happy how they turned out. I have plenty of plans to expand them. Eventually I hope that they will make up a smaller militia force. And now, it is time to finally removing the shrink wrap on the titanicum box :D .
Killteam 40k. Skitarii conversion. Militia 30k. I am continuing my killteam project as well as my militia project. Combining more or less three different 40k kits and a bunch of random spear parts. Initially these models will be used for killteam. But I do plan on having these guys for 30k as well. Of course there numbers have to grow and considering how long they take to build I guess it will take a long time before they form any kind of proper army. However I have so much fun building these guys, so I am mostly looking forward to make more. Now I have a couple of days to work on these before Adeptus Titanicus arrives to my doorstep. This is also something I have been waiting for, for a long time. So much fun projects on the horizon. It seems too be a great ending on the summer and an awesome start to this fall. There we go. The killteam terrain is now finished or at least its good enough to put on the table :) . This week I plan on getting my first game of killteam on the way and inte following week Titanicus should have arrived :D .